Reconciling the past and present and remembering my father's love of the the spirit of Christmas. Back in the early 1900s my father walked barefoot to midnight Mass on Christmas Eve from his village to Dingle in Co. Kerry, a distance of seven miles. My 13-year-old daughter this Christmas expects to finally get that fancy iPhone accessory she has wanted for a while. She adores Christmas. Two different generations, connected through me, but the magic of Christmas holds in both cases. I think my father got the better of it, though, and that is a reflection on modern times, where Christmas has become about cash machines ringing, not sleigh bells. I mean how much more do we all need or want? The simplicity of life back in rural West Kerry around 1915 was total. I don’t want to draw a sentimental veil over the hardships, but there is no doubt there was a neighborliness and companionship that has all but vanished in most places now. Christmas brought the best of that spirit together. As I write this I am listening to my father, dead since 1978. Like me he was a writer, except he wrote in the Irish language, something I have tried and failed to do. He recalled, most vividly, on numerous radio programs the Kerry he grew up in long ago. One of the greatest gifts I ever got was when I was presented with his radio talks from long ago from the Irish radio archives. It happened when my brother, Fergus, a politician in Ireland, and I were on the same station this Easter talking about families and brotherhood. So I turn on and tune in. At first when I listened, the sound of my father’s voice upset me as I had not heard it since 1978. Did he really have such a distinctive Kerry accent? Yes he did, and when he spoke Irish it connected me in a profound way to all the generations who came before him who used it as their first tongue like he did. Kilcooley, his village, seemed like an especially magical place at Christmas. Christmas Eve was when they would walk with shoes tied around their neck to the little church in Dingle. They would never let the townies in Dingle see them without their shoes on, so they begged and borrowed a pair from neighbors or whoever to make sure they looked the part. Often times he remembered it rained on that journey into town and they would arrive, bedraggled and drenched, but happy in their childhood and shared experience. He described the visiting to the various neighbor’s houses around Christmas time when there were no distractions, neither radio or television, but just the old folks and the fairy and ghost stories and the talk of who was in America and when, if ever, they would return. These days we talk about Facebook integration and the global community. What Facebook hopes to catch is what my father’s neighbors had all those decades ago, a tight knit, utterly integrated group of human beings whose lives were linked and interdependent. 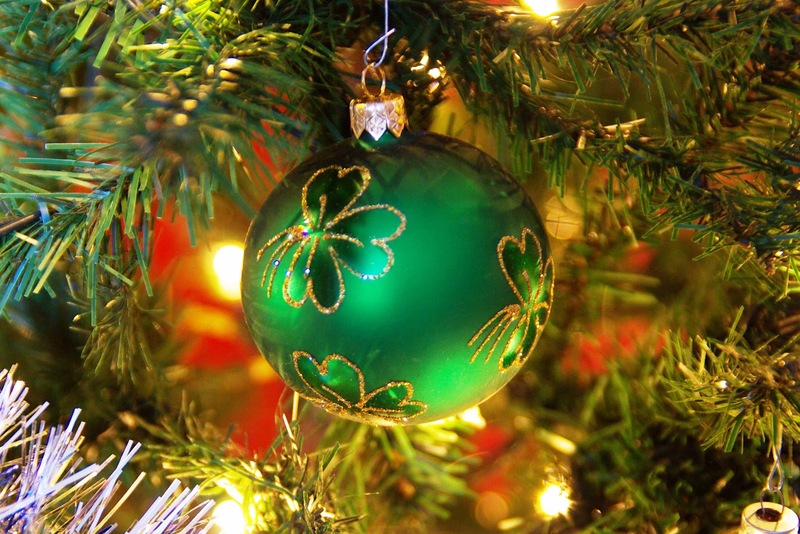 “I Scath a cheile a maireann na daoine,” says the old Irish expression, which loosely translates, “In each other’s shadow the people live.” That was how it was in West Kerry long ago, never more evident than at Christmas time. I suppose I straddle both worlds, remembering a time when there was no television and a neighborliness that has long since vanished in most parts. As for my daughter, what will she tell her grandchildren? Santa Claus will still be around to charm them and to thrill, as will the feeling of warmth and appreciation that Christmas inevitably brings. They never met, my daughter and father, but they have much in common, including a love of the spirit of Christmas, that surpasses all else. I like to think that somewhere out there he will watch her unwrapping her presents, seeing the magic of Christmas once again rekindled in her eyes.